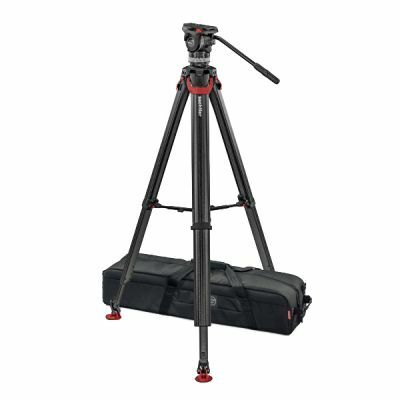 The Sachtler 1017MS System Ace XL fluid head with flowtech 75 tripod legs offers a tripod system for videographers who use cameras weighing up to 8 kg/17.6 pounds. The Ace XL system enables broadcast-style performance while using lightweight components more suited to HDSLRs and compact camcorders. The Ace XL fluid head features fiberglass-reinforced composite construction and weighs only 1.7 kg/3.7 pounds. The two-stage carbon fiber legs weigh only 2.9 kg/6.4 pounds. This makes the system lightweight at only 4.8 kg/10.6 pounds. The unique flowtech 75 is easier and faster to deploy and adjust than any other tripod. Supports cameras with up to 8 kg/17.6 lb, 8-Step Counterbalance, 3-Pan/Tilt Drag Grades, system includes Ace XL fluid head (S2150-0004) + tripod flowtech 75 with rubber feet FT + padded bag 75 (9116); flowtech 75 is a 2-stage 75 mm carbon fibre tripod with unique quick release brakes for instant and easy deployment, ergonomic carbon fibre design with strong magnetic leg locks for comfortable transport, exceptional torsional stiffness and a versatile hinge lock mechanism for low and high shots.